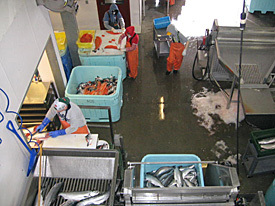 Processing is defined in regulation by the Alaska Department of Fish and Game (ADF&G), the Alaska Department of Revenue (DOR), the Alaska Department of Environmental Conservation (DEC), and the National Marine Fisheries Service (NMFS). The different managing agencies define processing very similarly, but there are a few differences. Gutting, gilling, or icing are not considered processing. Heading shrimp is not considered processing.